The McFaddin-Ward House takes its 2016 Lecture Series on the road this month with a film documentary about forgotten artist Frank Reaugh. Experts consider Reaugh (prounounced Ray) to be one of Western art’s most prolific creators. He painted more than 7,000 pieces, yet when he died, most people had never heard of him. The Texas art scene has recently renewed its interest in Reaugh, largely due to a recent film documentary about his life and works. 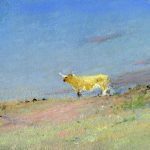 “Frank Reaugh: Pastel Poet of the Texas Plains” pays tribute to a great artist and teacher. Its producer, Marla Fields, will discuss her film at the Art Museum of Southeast Texas on August 18th. The McFaddin-Ward House is proud to share the event at AMSET’s larger venue. Frank Reaugh produced thousands of vivid pastels of the Texas Plains. Unlike other painters, though, he focused on animals rather than cowboys. Each summer he would bring a group of students on “Sketch Trips” to far west Texas and teach them his methods. Many call him the “Dean of Texas Painters”. “What’s remarkable about Frank Reaugh is that very few of us knew what’s remarkable about him,” critic and novelist Michael Ennis remarks in Fields’ documentary. Now, we’re beginning to, again. He was still working into his late 70s, but by then the art world had passed him by. “People forgot him before he was ever done painting,” art collector Bill Cheek said. A former radio DJ in Temple and Paris (Texas) and now a freelance video producer living in Frisco, she set out to learn all she could about him. Her superb documentary, five years in the making, reintroduces Reaugh to art lovers and to his fellow Texans. 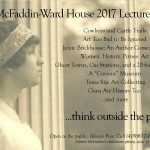 The 2016 McFaddin-Ward House Lecture Series continues with a special evening of antiques. If you love collecting old objects, you won’t want to miss this presentation. Antique, Art, Pottery, Porcelain, and Glass expert, David Lackey, brings his knowledge and talent to the McFaddin-Ward House in its continuing 2016 Lecture Series. Speaker, David Lackey graduated from Baylor University, dealt in antiques for several years, then did intensive study at Christie’s Fine Arts in London. He has been a collector for most of his life, starting at the young age of 6 when he received an antique penny bank in the shape of a house. This simple gift ignited David’s passion for collecting old objects, and he began to shop with his parents at flea-markets and garage sales. By the age of 12, he was selling at weekend antiques fairs and to other dealers who appreciated his keen eye for quality items. David Lackey presently owns an antique shop in Houston, creates his own art, and can be seen appraising collectibles on the enormously popular PBS series Antiques Roadshow. Please join us for this enlightening lecture and find out how he determines what your special “something” is worth. Our lectures are FREE and open to the public, but seating is limited. We take the first 90 visitors who arrive. Doors open at 6:00 p.m. If you love antiques at the McFaddin-Ward House, chances are you’ve heard of Antiques Road Show. Items in our collection would be dream-finds on the popular PBS Series where Average Joes and Janes rustle up antiques and collectibles for a televised appraisal. From garage sales to grandpa’s attic, it’s an array of everything from the beautiful to unusual. Sometimes, they hit it big. One popular appraiser on the show is David Lackey, a Houston antique and art dealer, collector, and expert. In addition to creating his own art, Mr. Lackey owns an antique store in Houston. The McFaddin-Ward House has invited Lackey to speak at a free lecture in May. David Lackey “grew up” in the antique business so-to-speak. On his sixth birthday, someone gave little David an antique penny bank in the shape of a house. This simple gift ignited David’s passion for collecting old objects, and he began to shop with his parents at flea-markets and garage sales. By the age of 12, he was selling at weekend antiques fairs and to other dealers who appreciated his keen eye for quality items. After graduating from Baylor University, David worked as a buyer for Foley’s Department Store, although he continued to sell collectibles on weekends. He sold china and crystal he’d bought at estate sales, and pretty soon, David became known as a local expert in ceramics and glass. By 1983 David Lackey was dealing antiques on a full-time basis, but he longed to further his knowledge. Two years later, he liquidated his business and enrolled in an intensive year-long course at Christie’s Fine Arts in London. David returned to Houston in 1986 and re-opened his business which flourished. Ten years later, along came Antiques Roadshow. In the first season, David was asked to appraise pottery and porcelain for a filming in San Antonio, Texas. His appraisal aired on the show and David was invited to other venues. Since 1998, David has appraised at every Antiques Roadshow filming and traveled to over 100 cities. David Lackey’s lecture on Antiques, Porcelain, Pottery, and Glass will be held Thursday May 12th at the McFaddin-Ward Visitor Center, located at 1906 Calder in Beaumont. Doors open at 6:00 p.m. The lecture starts at 6:30. The lecture is free, but seating is limited to the first 90 people who arrive. The McFaddin-Ward House and LoveYoga are excited to bring you Mondays at the Museum. The McFaddin-Ward House will open up its lawn on the last Monday of the month for a little bit of yoga and a lot of scenic surroundings. Join us on the east lawn of the museum for a donation-based session. It all starts at 6:45 pm! Starting April 28th, the McFaddin-Ward House will open up its lawn on the last Monday of the month for a little bit of yoga and a lot of scenic surroundings.